A few months after escaping an emotionally abusive relationship, feeling strangled and suffocated by the enormity of that secret, I made a controversial choice: I wrote about what had happened on my Facebook page. 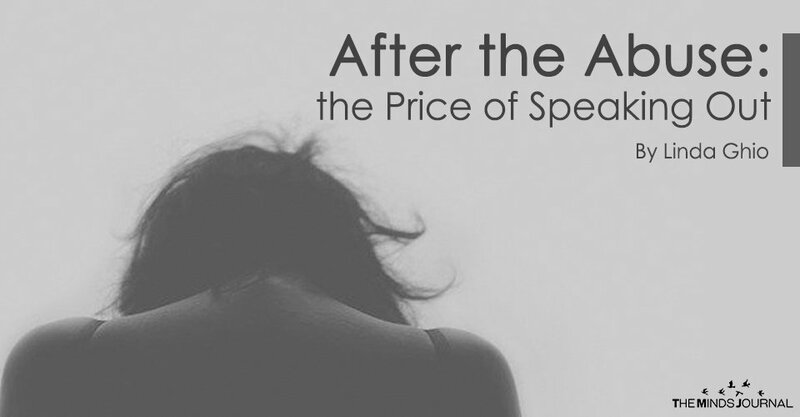 Speaking out about abuse has its price. It has got to be hard to read for those who have not lived it: I get the awkwardness of not knowing what to say. I get that friends and relatives feel powerless reading my story. There is nothing to say or do that can solve the problem. What comfort can possibly be offered? There are no magic words that can fix the long-lasting damage left by abuse, or make it easier to understand. On a strictly practical level, talking about it is useless: I do not do it in order to find a fix, because there is none. I get that someone might therefore think there is no use in discussing it or analyzing it if it is not going to lead to any concrete results. For those who have been through it, that is not the case: there are one hundred facets to process, a hundred different consequences to face. It is a long, tortuous process that strains your mind every day. At times you would like to keep repeating the same thing over and over again because then maybe, sooner or later you will find some meaning, an explanation, you will be able to accept the senseless cruelty that has been dealt to you for no discernible reason. You would like to scream it out until the whole indifferent world hears you, or even just to get it out of your bursting head. And, maybe, to make other survivors feel a bit less lonely. There are some who disapprove of openly discussing experiences of abuse: the belief that dirty laundry should not be aired in public is hard to kill. Because it is unpleasant: because it makes people uncomfortable. Maybe some think it is just attention seeking. Maybe some, especially if they only know the charming side of the abuser, think it is “unfair” for the victim to speak out and ruin his scintillating reputation. It is the same reason why I suffered his abuse in silence for months: to not make him look bad, to protect him, to be “fair”, and what was the result? That he kept behaving worse and worse, sure that nobody would find out, and I was alone in that horror, unable to ask anyone for help. Covering for my abuser out of love and politeness only enabled him to keep abusing me. There are those who knew us as a couple, and I get that it is going to be awkward and unpleasant for them. Maybe some do not believe me: after all, with them he was always kind, generous, fun, the perfect drinking buddy. I remember how everyone adored him, especially the girls he worked so hard to impress. Everyone trusted him – unbelievable how he could morph like a chameleon in a hundred different people to become everyone’s best friend; absolutely unbelievable how skilfully he could hide the monster he became in private – to the point that they could not believe the awful things he had done, not even confronted with hard evidence. I get it: they were so absurd, so senseless that I could not believe them either, even after seeing the monster with my own eyes. For months I tore my brain apart trying to reconcile his two identities, the kind and lovely guy with the horrible things he did, trying to find a rational explanation. I did not manage. How can I expect someone who never experienced it to?